Remember when Denny Green said "If you're looking for Denny Green, look on the high road, because that is where I'll be"? Apparently the high road that Denny was speaking of was a stint as a coach in the soon-to-be-defunct UFL. Anyway, Jeffrick and I have decided that the Gopher Football Blog has run its course. The feeling started coming over me several months ago, and then coincidentally we were asked to join The Daily Gopher, an invitation which we accepted. So, if you're looking for Jeffrick and JDMill, you won't find us on the high road, we'll leave that to Denny Green. Where you WILL find us, however, is at The Daily Gopher. I started this blog right around the time that Tim Brewster started heading up Gopher Nation, and it's been a lot of fun. I was excited when I brought Jeff on and we began doing some podcasting. But it's always been difficult to juggle life and put together a blog that communicates our love and passion for Gopher football. At The Daily Gopher we'll continue to get to write and podcast about what we love, we'll get the benefit of the tools and support of a very strong blog network, and we won't feel the pressure to promote and try to build the blog. In short, we'll get to do what we love without all of the administrative mumbo-jumbo that comes along with it. We'll miss it here, but we are really looking forward to our new home. If you weren't already reading The Daily Gopher every single day, I'm not sure why not, but you should start (and it should be easy to find because I've already hyperlinked to it 4 times. Thanks for your readership over the last couple of years! p.s. You will continue to find me writing at Off Tackle Empire (formerly The Rivalry, Esq). Like Jermo said last week, I too am really, really excited for Gopher football to start. Dare I say, I'd almost call myself optimistic about what we should see out of Brew's Crew this season, especially when compared to the incredibly low expectations that have been set for this team by every possible media outlet that covers college football. The Gophs have been picked to finish no better than 9th in the Big Ten this year in every publication and preview I've read, and I've seen nary a Gopher player picked as first or second team preseason Big Ten. Adam Rittenberg on his Big Ten blog on E!SPN.com has been listing his top five units for each position (Backfield, offensive line, linebackers etc) and not once has Minnesota been ranked. Brewster is apparently guaranteed to be fired and we've got nothing to look forward to but getting the snot kicked out of us all season long. It's Adam Weber's last year as a starter. Seriously, how great is this? This will be the last season that I'll have to endure bad start after bad start after bad start, only to hear his supporters blame everyone else- the offensive line, the coaches, the receivers, BP, Obama, the cast of Jersey Shore- for Weber's struggles. I hope Weber has a good year and meets his supporters' expectations, but I'm not exactly holding my breath. His 2008 2nd Team All-Big Ten season was an absolute fluke, taking advantage of his first seven games when he was great, as well as the weakest year for Big Ten quarterbacks in the history of humanity. He will NOT be an all-conference quarterback again (although a big part of that is because of just how loaded the Big Ten is this year. Holy Moses the conference is as deep and talented as it's been for at least the last decade, if not longer), but I'm not even hoping for that. Just a completion percentage north of 55 would be dandy, as well as more TD's than INT's. Really. So Weber beat MarQueis fair and square apparently, and now Gray is getting a ton of reps at wideout. As long as Brewster is being truthful when he says Gray will get another crack at the starting QB job next year (although really, Brewster can say whatever he wants because there's a good chance he won't be around next season anyway. So he can say that Gray will be the QB and the Gophs will win 21 games and be better than the Vikings and that he'll be sole reason for an economic turnaround. Seriously, he can say anything and it doesn't matter if it's true. Perhaps his next gig should be to run for governor? Can't be any worse than Pawlenty), I applaud this move. It DOES get your best athlete on the field and in the game, and he'll be another weapon for Weber to throw to. I'm guessing the faster Gray learns the nuances of playing receiver, the more reps he gets, unless more than one of DaJon McKnight, Troy Stoudermire, Brandon Green, and Bryant Allen really asserts themselves, there's a starting spot there for Gray for the taking. The more I read about our young, athletic D-line, the more excited I get. Brandon Kirksey could be a force inside, and how can you NOT get all amped up for redshirt frosh Rashede Hageman? a 6'6 280 pound freak of nature blowing over, around or through blockers off the edge? Sign me up! Yes it's going to be tough, but when was the last time we've had USC, Penn State, Ohio State AND Iowa all come visit Dinkytown in the same season? Oh that's right, never. I'll take this schedule over Cupcake Central that we saw under Glen Mason every time. Now if we can just start competing and winning some of these games, it'll be even better. I finally admitted it on the phone to my uncle on Friday evening. I haven't even told Jeffrick yet. I've really been trying to suppress it, but it bubbled out of me on Friday and for some reason, before the sun rises on this Sunday morning I'm prepared to share it with all of Gopher Nation. Or at least the dozen or so people that read this blog when they are trying to kill some time. I blame the media. They've been printing quotes by Gopher players and coaches and they've seeped into my subconscious. I blame some of the posters over at Gopher Hole because some of them have been talking about it for months as I lurked quietly back, shaking my head and rarely posting anything in response. I'm beginning to feel a bit of optimism about this Gopher football team. I know, I know, I've been negative for months. I was annoyed by Adam Weber all of last season. I was disgusted by our play in the Insight Bowl against Iowa State. I was skeptical of Brewster's insistence on there really a quarterback competition going on during the spring. But as actual football is returning to our lives, my attitude toward what we might see on the field this fall is thawing out a bit. Here are a few things that I wasn't really thinking clearly about that currently have me a little bit excited. *Yes, we lost 9 starters on defense. Yes, that is a staggering number. And yes, the two starters that ARE returning had an injury (Royston) and a run-in with the law (Theret), during the off-season that put them slightly in doubt for the upcoming fall. But saying that we lost 9 starters on defense and then automatically assuming that that means this will be a completely inexperienced defense just isn't the case. Consider that of the 13 games that the Gophers played last season Kim Royston, Kyle Theret, Keanon Cooper, Gary Tinsley,Ryan Collado, Michael Carter, Anthony Jacobs, Jewhan Edwards, D.L. Wilhite and Brandon Kirksey saw playing time in 11 or more of those games, and all are in the discussion to be projected starters this season. Yes, the defense will be young, but it will also be filled with plenty of guys who have seen significant playing time, albeit not necessarily as starters. *Jedd Fisch might be a pretty smart offensive game-plan guy, but when it comes to actual coaching he might be an idiot. This is college football, this isn't the NFL, and by all accounts, Fisch installed an offense for the Gophers last fall that was filled with motion and intricacies that our players just weren't equipped to handle. Add to that the fact that Fisch (and I'll put at least part of the blame here on Brewster because while Fisch was calling the plays, Brewster is STILL the head coach of this team and when the fish stinks, it stinks at the head) seemed more than willing to abandon the run in games painfully early last season and continually called plays that forced Weber to make throws into the flat (his least comfortable and least successful type of throw), and you begin to see why maybe it's not such a horrible thing that ol' Jedd headed west to try out NFL pastures. That, and he's an idiot. I'm not quite prepared to say that I'm super excited for Jeff Horton, but in retrospect, I'm pretty glad that Fisch is gone. Additionally some of the things that I've been hearing have me at least intrigued about what Horton is doing with Weber and the offense. "We've had only 15 practices with coach Horton so far, but I already know that we're not going to try to trick ourselves," Weber said. "This style of play is more of a traditional style of football. For a while the spread became very popular, and it still is, but this style of play is more suited for the talent we have on our team. For me, I feel most comfortable in the I-formation with play-action fakes and being under center. That's what I was recruited to play. I wish I had more seasons with it." A couple of things become clear from that quote. First, Weber isn't in awe of the offense in the sense that it's over his head. He seems to be comfortable with what is being installed and happy about getting back to something more simple. Second, Jedd Fisch was an idiot. Another point is that Weber appears to be in much better health than he was at this time last season. Looking back, perhaps not enough was made of the fact that Weber was coming off of shoulder surgery and hadn't had the chance to condition in the off-season the way you'd like to heading into a Big Ten football season. A guy who is confused by the offense he's trying to run and is also not confident in his body is a really good formula for a poor season... which is exactly what Weber had. I would like nothing better than to see Adam Weber have the kind of season that he had in 2008, and with the talent that he has around him, this could translate into some very good numbers. *There are definitely a lot of expectations in place for the 2010 Gopher Football season... fortunately almost all of those expectations are very low. You cannot find a place anywhere on the internet that predicts the Gophers to finish anywhere but the bottom three in the Big Ten. In fact, in a completely unscientific research project, funded only by me and fueled by Diet Mountain Dew, I went to The Google, and searched "2010 Big Ten Football predictions." (My research methods are quite advanced, I know.) Of the articles on the first page of results that actually ranked how they thought the Big Ten would pan out in 2010, EVERY SINGLE ONE predicted the Gophers to finish DEAD LAST in the conference. (To which my wife replied "...it's going to be a painful season.") Every. Single. One. Call it bulletin board material, call it motivation, call it whatever you want. The fact is nobody expects us to do jack squat this year, and considering how last season ended, and considering that we lost perhaps the single best player in the history of the program from an offense that was... well, bad, that shouldn't be too surprising. To quote a line from the Gin Blossoms song "Hey Jealousy": "If you don't expect to much from me, you might not be let down." So here's to having low expectations... but secretly having a little bit of optimism. Ladies and gentlemen of Gopher Nation... do you feel that? Do you feel the rumble? Can you feel the air moving? THAT'S RIGHT GOPHER FANS... practice has started. This morning at 6am I was running wind-sprints at the Gibson-Nagurski football complex... okay, that's not true, but the Gophers were. And so it begins. IT'S FOOTBALL SEASON!!! Both the PiPress and the Strib (by the way, Phil Miller, welcome to the Gopher beat, you're already a breath of fresh air) had tidbits on the Gophers yesterday and I thought I'd add my own tidbits to their tidbits. Marcus Fuller is reporting that Ra'Shede Hageman has become a beast. "Former tight end Ra'Shede Hageman's transition into a load at defensive end amazes even Kirksey, a junior defensive tackle. They both bench press over 400 pounds, but Hageman power cleans 390 pounds." Hageman looks like he could make an impact on the D-line as a redshirt freshman and how nice would it be to see a true pass rushing and run stuffing, long and lean lineman coming off the end. Also, remember when this guy chose to go to Minnesota because he wanted to play TE? Doesn't look like he's got much interest in lining up on the offensive side of the ball anymore. Fuller also talked to Brandon Kirksey, who will be a team captain this fall, and Kirk is ready to step up and, along with his coaches, expects to be one of the top D-tackles in the conference. "Gophers coach Tim Brewster said the 295-pound Kirksey has a chance to be one of the top defensive tackles in the Big Ten this year. The St. Louis native said he's been hearing that kind of praise from his defensive line coach Tim Cross since last season ended, and even more after he was named a captain. 'It motivates me to know that my coach feels that way about me,' he said. 'It's nothing new. Coach Cross and I always talk about it, but it's time to fill the shoes.'" I have loved our defense that last couple of years, and I feel like they got a bad wrap in 2009 because they were constantly playing from behind and having to make up for where the offense left off, but with 9 starters graduating, there's been some concern about them. But I'm getting more and more excited to see how this defense performs. It definitely is lacking experience, but by all accounts they are a more talented group than we've seen the last couple of years. PhiMill says that Brewster and his staff will be isolating the freshman for the first 3 days of practice in order to give them more individualized attention. "Freshmen will take the field at 9 a.m. each morning, and everyone else will practice at 3:30 p.m. After a weekend of coaching emphasis on fundamentals and technique, the newcomers will join the vets on Monday as regular two-a-days begin. 'It will help, most importantly, from a confidence standpoint,' Brewster said of his 20-member freshmen class. 'They'll go into the fourth day with the older guys much more confident.'" Here we go folks. We're going to start getting reporting on ACTUAL football, not just quotes and jottings and conference expansion and realignment and recruiting, but actual football!!! "I was spending my time in the doldrums..." is the opening line of the song "Lost For Words" by Pink Floyd. It's one of those songs that I haven't actually heard for probably a decade, but it sometimes pops into my head, and that opening line in particular describes how I feel about these last days of the summer of 2010 without Big Ten Football. I really wanted to be excited about Big Ten media days. I really wanted to be excited about hearing what Brandon Kirksey, Kim Royston, Adam Weber and Coach Brewster have to say about the upcoming Gopher Football season. I had convinced myself I was going to follow it closely and write blog posts about it and that it was going to be an exciting way to jump into the football season. But then I realized something... it's all just talk, it isn't football, and it isn't quite quenching my thirst for Gopher Football like I was hoping. Then something else happened. As a fan of the Vikings, the news hit today that Brett Favre (allegedly) will be retiring for real this time. Suddenly I was thinking "this is good, this will be a good distraction for a couple of days until Gopher football practice kicks off." But you know what? I got bored with the Brett Favre news in about 20 minutes. So here I sit again, spending my time in the doldrums, just waiting for Gopher football season to start. I can't wait for the talk and the speculation to stop and for the season to just begin. I even think that I might be excited about practices (it's possible I'll be wrong about my excitement for practice like I was excited about media days) because at least we'll be hearing about how the players are performing and who looks good, instead of just the constant speculation. All I can say is bring on the football! Ladies & Gentlemen of Gopher Nation, please watch this video. The gentleman who comes from WAY behind of the fourth leg of the MN State High School 4x100 meter relay is Gopher recruit Devin Crawford-Tufts... and as you'll see, he's fast. DCT blows by the guy who was in first place at the beginning of the leg like he's standing still. Crawford-Tufts is your next Golden Gopher star WR and will join the Gophers in the fall of 2011. And both of those blogs point to national publications that have placed Coach Brewster in the Top 10 of coaches in college football whose derrière might be feeling the flames heading into the 2010 season. We've even mentioned it a few times around these parts, but I'd like to mention it again. Oh goody! Goody for you! Right? Why does Coach Brewster NOT deserve to be on the hot seat? Why DOES Coach Brewster deserve to be on the hot seat? And, despite what the national media and bloggers have to say, does Joel Maturi have Brewster on a hot seat? "If you go back 42 years, every Gopher head coach has gottenthe benefit of the doubt for at least 5 seasons, including Salem and Wacker." Certainly true. The history of Gopher coaches would suggest that Coach Brewster be given through the 2011 season to prove himself, get all of his players on the field, and solidify his coaching staff. Another reason people believe Brewster should be given 2 more seasons is that he has done a good job of increasing the talent of recruits that are coming through the doors of the practice facility. I don't think anyone would argue with this. In his 3 full years of recruiting classes, Brewster has ranked 3rd, 6th, and 6th in the Big Ten, while the previous regime was consistently 9th or 10th. Additionally, Coach Brewster has worked hard to instill an expectation of winning at the U of M. This actually could end up being his own undoing if he ends up not being able to live up to the expectations of Rose Bowls and Big Ten Championships that he is aspiring to, but at least he's talking about those things. Tim Brewster really believes that Minnesota can have a competitive program. He really believe that Minnesota is historically a good program that can get back to that point. He really believes he can win here. That's a lot more than we can say for the previous regime. "In just three seasons Brewster has not beat one rival. In three seasons Brewster has not beat one team that he wasn't supposed to beat. In three seasons Brewster's teams have not improved as the season went along." The only argument that he might get, and it wouldn't be coming from me, is that the 2008 win at Illinois was a game that one might say the Gophers weren't supposed to win, but that argument loses all water when you consider that Illinois pretty much fell off the face of the football earth after that game. Another argument that I've heard is that Brewster's seat should get hotter sooner because he inherited a better team than did his predecessors. Let's look only at records. Now, I realize that 3 years is an arbitrary number, but we have to start somewhere. With these numbers in mind, Tim Brewster is the only Gopher coach to inherit a team with a winning record since Joe Salem came on board in 1979. If the success of the new coach in a program is measured by his ability to take the team from its current level to a higher level, then it seems clear to me that Brewster started with the bar set at a higher level, albeit still a mediocre level in the grand scheme of things, than his 5 predecessors. Despite what the national media and bloggers have to say, does Joel Maturi have Brewster on a hot seat? Considering that Maturi gave Brewster a contract extension, many would say that he doesn't have Brew on the hot seat. But I don't think that move necessarily communicates confidence in his coach as much as it communicates a desire to show recruits some stability in the program. My fear with Maturi isn't really whether or not he has Coach Brewster on the hot seat, but what criteria he is going to use to make that decision. And even more concerning than that, is if he even has an idea of what that criteria should be. The reason I have this fear is because of how Maturi fired Mason. Now look, I'm not saying Mason shouldn't have been fired, because I was leading the parade, the bandwagon and the charge when it came to that move. But what I think is concerning about how Maturi fired Mason is that I have my doubts that Joel had any idea what would or would not constitute firing his coach until he was suddenly faced with an embarrassing collapse of a loss in a mediocre-at-best bowl game. I don't have any insight into this, it's just how I feel in hindsight considering some of the other moves Maturi has made and things he has said. When he was suddenly faced with that situation, he was up against the clock of the coaching staff's contracts being automatically renewed. That bowl game collapse was the only thing that really separated that year's Gopher squad from Mason's previous 7. They finished right around the .500 mark, they made a bowl game, they ran the ball well, and they were defensively susceptible to teams who threw the ball more than 50% of the time... all the hallmarks of Glen Mason football. So do I think that Coach Brewster is on Joel Maturi's hot seat? I don't. And the reason that I don't is because I have my doubts that Joel Maturi has a standard in mind for what SHOULD put a coach on the hot seat at all. I don't think that he's comparing Brewster to other coaches from the U or outside of the program. Again, I have no direct knowledge of this, just a feeling. While Brewster has done several very good things at the University of Minnesota, he has been given the keys to the castle to do so (upgraded facilities, increased resources in recruiting), and the good things he has done have not translated into wins on the field. Any measure of a coach HAS to put wins/losses at the top of the criteria, and by that criteria, Coach Brewster has maintained the status quo at best. So the question for Joel Maturi actually goes back to the firing of Glen Mason. Maintaining the status quo wasn't good enough to keep Glen Mason around, so why is maintaining the status quo good enough to keep Tim Brewster around? And furthermore, why is maintaining the status quo good enough for Brewster when he's been given better facilities and tools with which to recruit and run his team? The answer from Joel Maturi, I would hope, would be, it isn't good enough. So if it isn't good enough, how long does Brewster get to outperform the status quo? 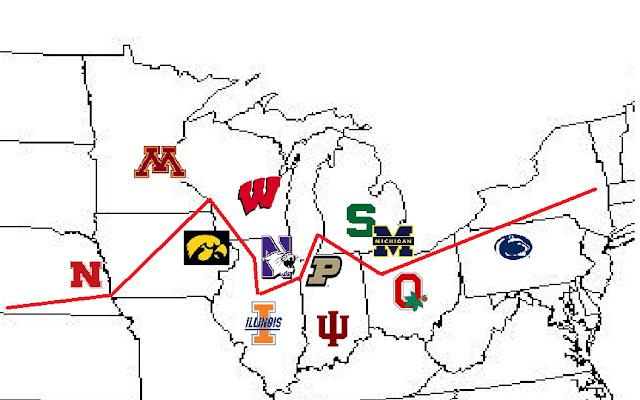 Earlier in the week E!SPN.com Big Ten blogger Adam Rittenberg addressed the central question in Big Ten realingment: what to do with Minnesota, Iowa, Wisconsin, Nebraska? The four neighbors share borders, values, rivalries and would seem to make perfect division mates. Nebraska is the fourth winningest college football program of all time, while Wisconsin and the dirty Hawkeyes have strong programs who in the last 20 years have won a Big Ten title, played in the Rose Bowl, and seem to make regular trips to New Year's Day Bowls. Iowa and Wisconsin have a strong rivalry building, as the two have met 85 times, the first in 1894. The Huskers and Hawkeyes are neighboring farming states who absolutely, positively eat, sleep and breathe Nebraska and Iowa football, and despite the two border states having played so little over the years, there's still a healthy rivalry brewing between the fan bases. Wisconsin and Nebraska have almost no history, but considering they share the same colors, and their fans share many of the same values and passions, them meeting annually would be a most natural fit. - The Gophs and Badgers have Division 1's oldest rivalry, as they've met 119 times, the first in 1890. They've played for Paul Bunyan's Axe- THE best rivalry trophy in sports- since 1948. - Minnesota has played Nebraska 51 times, more than any other Big Ten school, and lead the series 29-20-2. Of course, the Huskers have won the past 14 straight meetings, which includes the Gophs worst lost ever when Nebraska thumped them 84-13, so you can't really call this a rivalry. Still, if you're going to split the Big Ten into two divisions, these four schools clearly belong together. 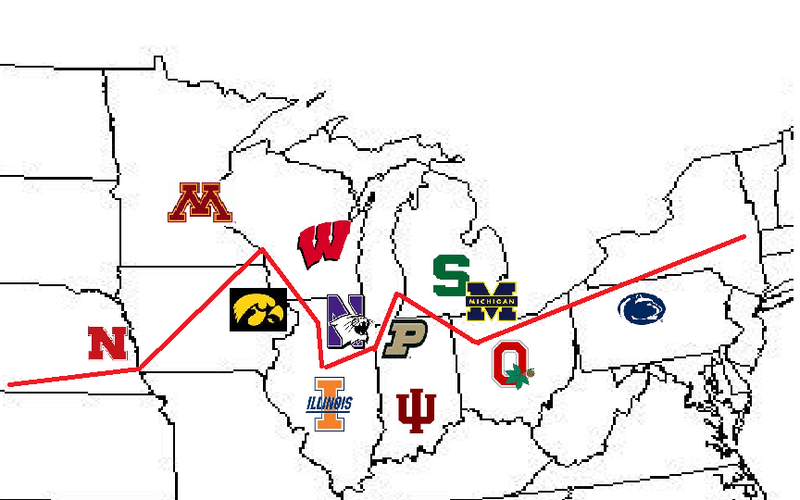 Add the two neighboring schools Illinois and Northwestern from The Land of Lincoln and it would create two perfect divisions from the standpoint of competitiveness, geography, and maintain rivalries. Honestly, not one fanbase in the Big Ten would be upset if the divisions were split with a simple East/West geographic split. Everyone wins right? Wrong. The only people who don't like this idea are the ones who drive the bus when it comes to college football- the Almighty Dollar. Yes television execs would not be thrilled to have three of the four highest profile Big Ten schools- Ohio State, Michigan, and Penn State- in the same division. For television it'd be fantastic when Nebraska represents the West and would play any of the Big Three east schools. But what happens in the years Nebraska doesn't make it? The TV folks like the odds of splitting these four teams to better ensure they meet in conference championship games more often. With the addition of Nebraska, the Big Ten now has four strong, nationally recognized college football powers, which includes Ohio State, Michigan, and Penn State. All four of those schools "move the needle" nationally when they're on TV, which is why the conference obviously would like two of those four to meet in their new conference championship game as much as possible. I totally get that. I would not argue that those four schools are the four most popular, and that even though Wisconsin and Iowa have excellent programs, they still aren't in that class of the other four for national followin. I also understand that the Buckeyes, Wolverines, and Nittany Lions have won or shared the past eight straight Big Ten titles, and have been extremely successful over the years. That right there is some good information. Despite Michigan's recent struggles, as well as the recent strong play of Wisconsin, Iowa and Nebraska (all three schools should start 2010 ranked nationally in the top 10), it shows over two decades how good the "Big Three" and Nebraska have been. Now I could argue that there's no guarantee Michigan will return to its Lloyd Carr glory days (how ironic- and TRUE- is that statement for Michigan fans? ), but Mandel gives a pretty clear view of exactly what conference Commish Jim Delany and company will be looking at: that based on these stats the Buckeyes, Wolverines, Nittany Lions, and Huskers have been, and will continue to be, the four flagship programs for the conference. Fine. So just to be clear, maximizing TV dollars for your title game is the ultimate goal for the Big Ten, right? They are hoping to get the biggest ratings year and year out for the next decade for that game, and the best way to ensure that happens to have as few championship games as possible that DON'T include at least one of the Big Four, and hoping to have as many as possible that would include at least two of those four? So if that's the case, I have one simple question: wouldn't splitting these four up actually HURT your chances of doing that? Splitting them two-and-two just means a BETTER chance of not having any of them in the conference title game and giving you worse ratings. While it seems like Ohio State would win any division every year for eternity based on the way they've played under Jim Tressell, they did have some "struggles" under previous head coach John Cooper (I use finger quotes around the word "struggles" because it was a span that 95% of college football fanbases, including Minnesota, would kill for) where they played in the Rose Bowl just once between 1986-1998, when the BCS was then created. As mentioned earlier Michigan is down now and there are zero guarantees Rich Rod, or the next coach, quickly get them back to an elite program. Penn State is great now but from 2000-2004 were just 26-33. Nebraska, once the most dominant program in the country, are still awaiting their return to glory since legendary coach Tom Osborne retired after winning a share of the 1997 national championship. Frank Solich took over, and in hind sight had a good run going 58-13 from 1998-2003, but because he didn't win the Huskers national titles and ONLY averaged nine wins a season, he was run out of Lincoln on a rail. The next four years under Bill Callahan from 2004-2007 were the definition of average with a record of 27-22. Bo Pellini looks to be getting things back to a championship level with a 10 win season in 2009 and the school's first national ranking since 2005, but again, all of the recent history for our Big Four schools show dominance is never permanent. So to split these four two-and-two almost guarantees less meetings between them in a conference title game. Having Ohio State, Michigan, and Penn State in the same division means you're almost guaranteed to have one of those three in your conference title game every year- and just having one of those three automatically means bigger ratings because of their national following. Sure playing the Huskers would give you a ratings bonanza, but even against Iowa or Wisconsin the numbers would be very strong because of the success of those programs. And when Northwestern or Illinois has a sneaky season and represents the West, you still have a much better chance of getting good TV numbers because you'd have a much better chance of one of the Big Three representing the East to offset a less "popular" program being in the title game. By my count, a simple geographic split of the Big Ten would keep All of the key rivalries intact, current and new ones would be strengthened, the divisions would be very competitive AND TV execs would have a much better chance of maximizing revenues for the Big Ten championship game by keeping Ohio State, Michigan, and Penn State in the same division. Sounds like a real win-win for everyone. Now if only I could convince the Big Ten of this. Everyone is talking about how the divisions will be split once Nebraska joins the Big Ten fray... so why should I be any different? Rittenberg today made his grand entrance into the discussion, with a proposed divisional alignment that, in my opinion, is just way too complicated. I get that divisions need to maintain a competitive balance, and they need to maintain rivalries, and that geography is really the last thing on anyone's mind, even though it does enter the discussion. But I don't think you can just ignore geography completely. We can all argue about how Northwestern is on the rise, and we can argue about how Illinois is down but are generally competitive, and that Purdue is on its way back, and we can bring all of the historical records we want to the table... fine. This is just one man's argument. If the tiers listed above hold true, in a 12 team conference, we of course want 2 teams from each tier in each division. This, in theory, should take care of the issue of competitive balance. To continue the formula that the Big Ten has mentioned, the next two most important factors, in order, are rivalries, followed by geography. Now, I've seen only two arguments about this. The first is that an East-West divisional split makes sense because of geography, while still maintaining rivalries, and manages to do a reasonable job of maintaining competitive balance. The other argument is Rittenberg's, that the East-West split doesn't get competitive balance close enough, so let's completely ignore geography and only focus on balance and protecting rivalries. Clearly each team would play their 5 other divisional opponents every year, followed by a combination of a protected rivalry (you've seen them all over the internet, I'm not going to rehash them here), and a round-robin of teams from the opposite division. You are still going to have protected rivalries across divisional lines, which is a given, but in this scenario you have natural protection of some rivalries, and can still easily protect many others across divisional lines. 1) Two more conference games on a rotating schedule of the other 5 schools from the Big Ten South, and still schedule 4 non-conference games. 2) A second protected rivalry (Iowa would still want to play Wisconsin every year and you'd probably like to see Nebraska play Iowa and OSU/PSU, etc), bringing the list of conference teams you'd play every year to 7. This would then mean that the final conference game would be rotated among the remaining teams in the other division. The unfortunate thing would be that you'd only see those other teams once every 4 years (i.e. Minnesota would only see Ohio State every 4 years). 3) A second protected rivalry game and drop the number of non-conference game to 3 (like the Pac10 has been doing for years). In this scenario Minnesota would see Ohio State at least every two years. There's going to be flaws with every system, and some of you have maybe already tuned me out (Jeffrick) because I have Ohio State and Michigan in separate divisions. Personally, I like the idea of having Michigan and Ohio State in separate divisions. Assuming Michigan regains its composure and joins the national power discussion in the coming years, I can't bring myself to envision a Big Ten where Michigan and Ohio State would NEVER play for the Big Ten title. I realize that by protecting rivalries and then having them in separate divisions that means they may play twice a year, and possibly on consecutive weeks, but again, I just can't envision those two never being able to play in the Big Ten title game, which would be the case if they were in the same division. Personally, I would like to see geography come into play with these divisions. The Big Ten is already a regionally proud conference and I think there's merit in maintaining regional flavor when splitting divisions. I also realize how difficult that is, which is why I set out to look at another option. Texas Now STAYING in the Big 12?!?!? You've probably seen the joke already: you know it's a strange time in college football when the Big Ten has 12 members and the Big 12 has 10. But it could get even stranger if Chip Brown of Orangebloods.com is right: Texas has now decided to STAY in the Big 12. How is this possible? Well honestly this should have been a plausible option all along because it's an option that looks to give the Texas Longhorns the most money AND most control over their product. And that's what this whole thing has been about from the beginning. According to Brown, a former beatwriter for one of the Dallas papers and a guy who seems to be more informed about expansion than anyone else covering it, Big 12 commish Dan Beebe made a late pitch to the Horns claiming a ten team Big 12 could still command a TV deal that would pay each member about $17 million a year (the same as the SEC), AND Texas would be free to pursue their own TV network, which would apparently make them an additional $3-$5 million a season. Add to that the reportedly $20 million in fees Nebraska and Colorado would owe the conference for leaving, and you can see how this still looks plenty appealing for Texas. And of course if it's appealing for Texas, you know the rest of the Big 12 lackeys will be on board since they either a) have to go where Texas goes or b) is better than the alternative of being without Texas either in the MWC or who knows where else? Well at least it's appealing for eight of the nine other current members whose colors aren't burnt orange: the lone dissenter remains Texas A&M, who also according to Brown have an invite to the SEC if they want it and would have a 6-3 vote from their Board of Regents to accept it if the vote was held right now. Tough call for the Aggies: stay with what you know, continue your 100 year rivalry with Texas, and continue to cater to the Horns every whim. Or leave for a much tougher conference, but one with more prestige, more money (by adding the Aggies the SEC would add the Dallas, Houston and San Antonio markets, which would assuredly push each team's TV payout north of $20 million a year), and would get them out of the shadow of the Longhorns. Perhaps A&M uses this as leverage to demand a bigger payout from the Big 12, or to balance the TV revenue a little so Texas doesn't get more than everyone else. While every school is trying to do what's best for them and makes them the most money, this entire process revolves around Texas and everyone has to follow. So I find it interesting that for the second time in a month, the Horns have managed to push the onus and blame onto someone else for what happens to the Big 12, knowing full well that regardless of the outcome Texas will still come out better than anyone else. Stay tuned. E!SPN.com is still saying this morning that Texas, OU, OSU and Texas Tech are bound for the Pac 10. I tend to trust Brown's reporting on this a lot more than E!SPN's, but until an official announcement is made, we'll hear a lot of differing opinions on what will happen. We do know there will be Board of Regents meetings at Texas and Texas Tech tomorrow, A&M regents meet Thursday, and the Texas Legislature has called a hearing for Wednesday to try and get attention- I MEAN to work for the best interests of their wallets- I MEAN to work for the best interests of the state universities and their tax payers. 10 Things I Like and Don't Like About the Gopher Season So far.